Company sergeant John Skinner, VC. A memorial to a First World War Victoria Cross hero was unveiled in his Highland birthplace yesterday. The ceremony for Company Sergeant John Skinner was performed at Inver, near Tain, by Lord-Lieutenant Janet Bowen. A small crowd gathered in bright sunshine to witness the unveiling a memorial stone for the solder, who had served for the King’s Own Scottish Borderers. He was awarded the VC for his outstanding bravery in the battle of Passchendaele in August 2017. The soldier is renowned as a daredevil war hero for his war-time acts. His citation reads “For most conspicuous bravery and good leading. “Whilst his company was attacking, machine gun fire opened on the left flank, delaying the advance. “Although CSM Skinner was wounded in the head, he collected six men, and with great courage and determination worked round the left flank of three block houses from which the machine gun fire was coming, and succeeded in bombing and taking the first blockhouse singlehanded. “Then, leading his six men towards the other two blockhouses, he skilfully cleared them, taking sixty prisoners, three machine guns, and two trench mortars. 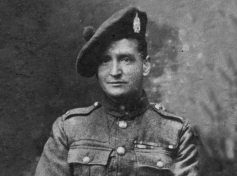 Though injured, Skinner – the son of a tailor whose family had moved to Glasgow from the Highlands – decided to ignore orders sending him home to Scotland and instead returned to his unit in Belgium. On March 17, 1918, he was shot and killed as he tried to rescue a wounded man. At his funeral in Vlamertinghe, Belgium, his coffin was carried by six other VCs, including a general and a private, standing shoulder to shoulder. It is thought to be the only time six VCs have acted as pall bearers. Local councillor Alasdair Rhind said: “This is a lasting memorial in his home community.